Government troops in eastern Democratic Republic of Congo have recaptured a key military base from the M23 rebel group, an army spokesman has said. Cheering crowds reportedly welcomed the troops as they entered Rumangabo town, where the base is located. It is the fifth rebel-held area to fall since fighting resumed last week. The US has called for an end to the conflict, saying it was a "tinderbox" that could escalate into a full-scale regional war. Rwanda and Uganda deny persistent Congolese and UN allegations that the neighbours are backing the rebel forces. There is no doubt that the government forces have achieved huge victories over the rebels, says the BBC's Maud Jullien in the capital, Kinshasa. Their next target is likely to be the headquarters of the M23 in Bunagana, which borders Uganda and is about 86km (54 miles) from Rumangabo, she adds. The UN Security Council is due to told emergency talks on the conflict later on Monday. The UN has deployed a new intervention brigade to eastern DR Congo with a stronger mandate to confront armed groups. On Sunday, the UN mission in DR Congo, Monusco, said a Tanzanian peacekeeper was killed during fighting with the M23 in the town of Kiwanja. "The soldier died while protecting the people of Kiwanja," Monusco said in a statement. Peace talks between the government and M23, hosted by neighbouring Uganda, broke down last week. It ended about two months of relative calm in eastern DR Congo. The government is re-establishing its rule in Rumangabo after government forces entered the town on Monday, said North Kivu province governor Julien Palukui. "We have just held two meetings in order to discuss how to uplift the population... and we are announcing the restoration of the civil service within the next 24 hours,'' he added. An Associated Press reporter travelling with the army said residents had welcomed the soldiers. Residents said rebel fighters fled on Sunday, firing shots into the air, AP reports. The military success in Rumangabo followed the capture of four other areas - Kiwanja, Rutshuru, Buhumba and Kibumba - since the weekend, the army said. It had existed since the time of ex-ruler Mobutu Sese Seko. The M23 had been using the base as its main training camp. At least 800,000 people have fled their homes in DR Congo since the M23 launched its rebellion in April 2012, the UN humanitarian agency, Ocha, says. M23 officials in Uganda said their fighters had retreated because government and UN forces had launched a joint assault, reports the BBC's Ignatius Bahizi from Uganda's capital, Kampala. Rebel forces were outnumbered, they said. The other side also had superior weapons, including helicopter gunships, the M23 officials told our reporter. 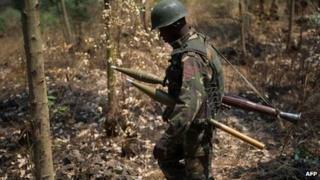 M23 fighters planned to regroup in Bunagana, before making their next move, the officials added. The US special envoy for the Great Lakes, Russell Feingold, said the fighting should stop. "I hope that President Kabila and others in the DRC see this chain of events that have occurred as something that enhances their credibility as a military, but that there are enormous risks in simply moving forward, believing that a military solution is the full answer," Mr Feingold said, AFP news agency reports. "It risks bringing in other forces into this matter that could lead to a cross-national war." The rebels briefly occupied eastern DR Congo's main town, Goma, in November 2012 before pulling out under international pressure. The M23 are mainly ethnic Tutsis, like most of Rwanda's leaders.